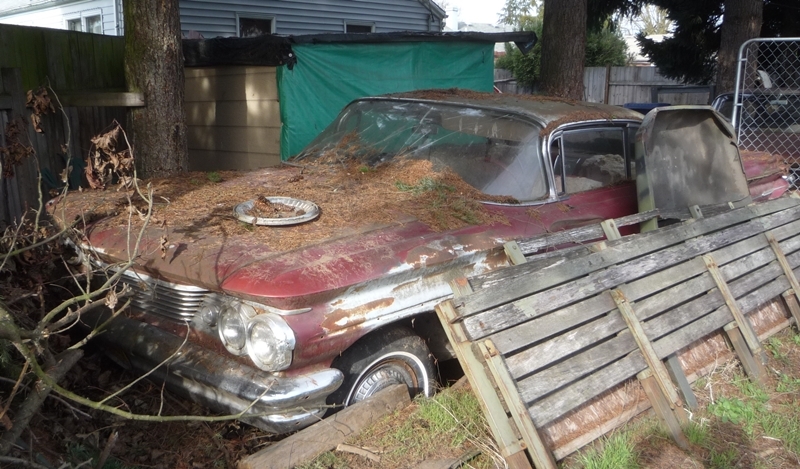 After shooting the 1960 Ventura Curbside Classic in the driveway, its owner Russ mentions that he just happens to have a couple of other 1960 Pontiacs out back. My heart jumps a bit: is there a Star Chief, please? Anything but. Oh well, the story is about having to adapt one’s dreams to changing circumstances, so let’s see what is out there. 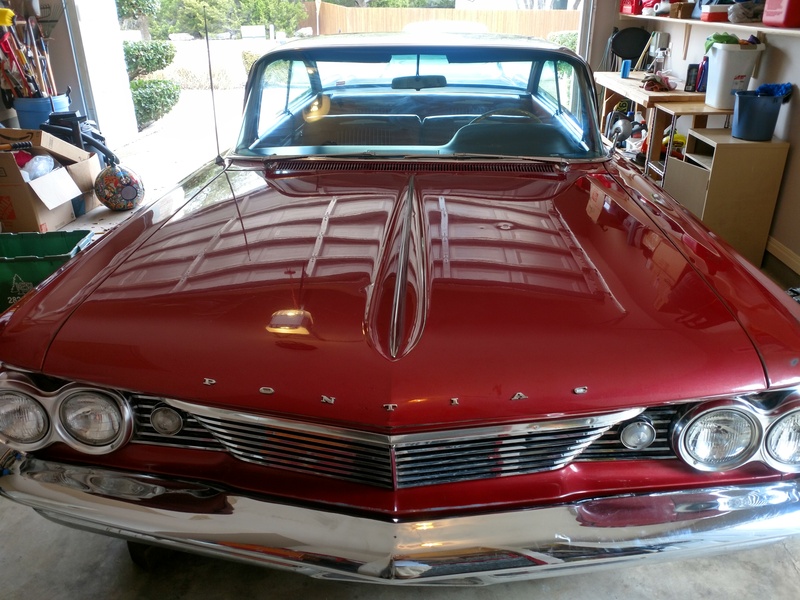 In 1960, Pontiac had four model lines spread over two wheelbase lengths. Yes, that was still the era where a couple of inches longer wheelbase put one a couple of inches higher in the social pecking order. The “junior” Pontiacs rode on a 122″ wheelbase. The Catalina was the entry-level Pontiac, competing fiercely with the low-price Chevy, Ford and Plymouth. 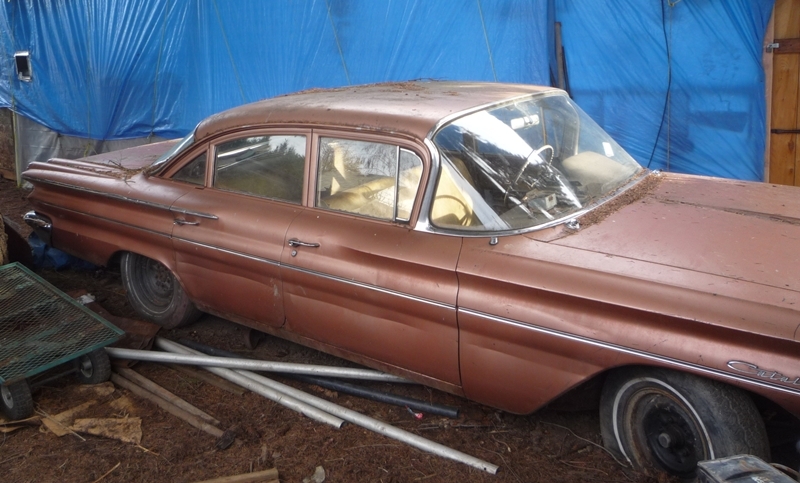 A Catalina hardtop coupe cost just $62 more than a V8 Impala coupe. For that amount, you got three inches of extra wheelbase compared to the Chevy, a husky 389 V8 instead of a 283, and that Pontiac look. A bargain indeed. 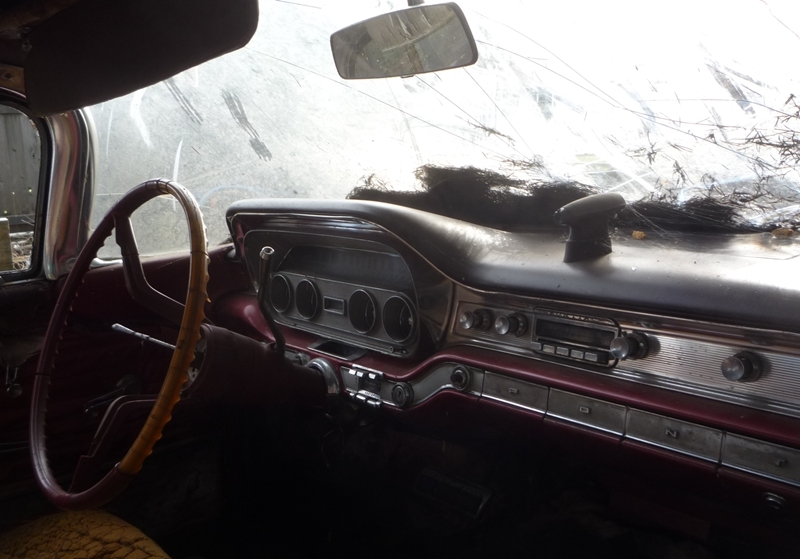 Russ has a pretty intact “stripper” Catalina four door, which he says won’t take much to run again. 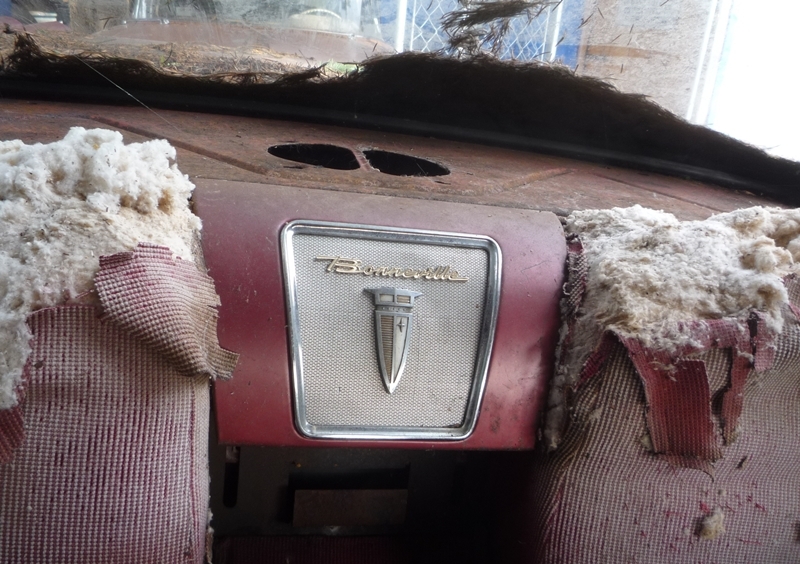 The Ventura was the higher trim model of the junior Pontiacs, costing a couple hundred dollars more. And it only came in the two and four door hardtop styles. In many ways, the best way to go. The senior Ponchos had a two inch graft in the wheelbase, which extended them out back. 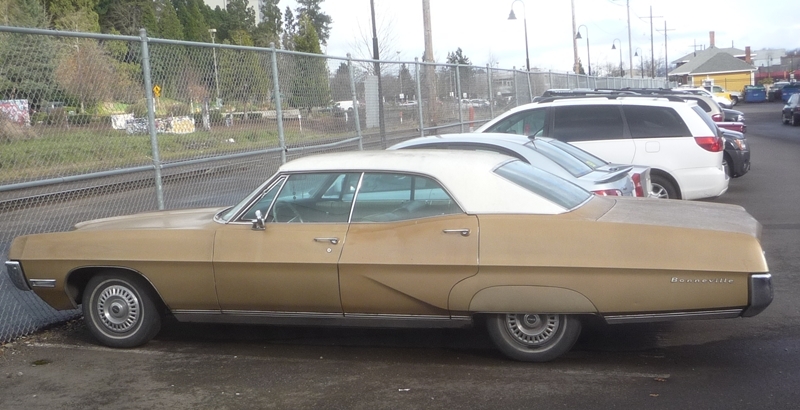 It’s pretty easy to spot when looking at them, like the ’67 Bonneville in yesterday’s walking tour: there’s an obvious gap between the rear door (shared with the junior cars) and the rear wheel opening. It looks a bit forced, especially on those four doors. My longed-for Star Chief was the lower level senior Pontiac, and the Bonneville was the top of the line. Russ’ red coupe (at the top) is a Bonnie, but it’s definitely in the parts car category, unless you just have to have one. It has a better trimmed dash and interior, including GM’s pioneering Autronic Eye automatic headlight dimmer. The Bonnie coupe also has the typical GM hardtop and convertible rear seat design, which includes that distinctive dip to make room for the (optional) rear seat radio speaker, what else would it be there for? But why is there a cutout on the rear package shelf? Have I been deluding myself all these decades? The final bit of Bonneville pecking order bragging rights are its tail lights, which are more complex than the Ventura’s. According to Russ, the inner lenses are the same as a Corvette’s. GM liked to keep its parts recycled across the lines. The Catalina sedan is the same color as Aunt Norma and Uncle John’s car which I wrote about in the thread for the Ventura. I loved that color of copper. Put a white roof on it, and this was the car from my childhood. No edit button. 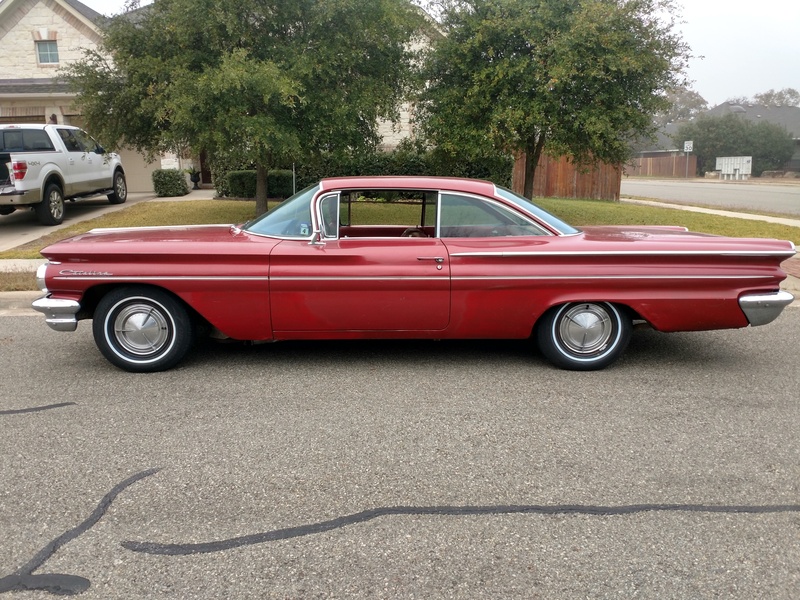 One other point – for the $62 that the Catalina cost over the Impala, do not forget that you got a 4 speed HydraMatic instead of the 2 speed Powerglide. The editor came, and mysteriously disappeared again. Someone is diligently looking for it. Actually, the Ventura and Catalina had the Roto-Hydramatic, which was somewhat trouble prone. You had to step up to the Star Chief or Bonneville if you wanted the stouter Turbo-Hydramatic. The less-than stellar slim Jim Roto-Hydramatic first made its appearance in 1961. The ’60s were still the good old four speed HM. You’re right. I just read an article on the 1960-61 Venturas and got my years mixed up. The Ventura itself was relatively rare. It was basically the Catalina chassis with a Bonneville-grade interior, while the Star Chief was a Bonneville chassis with interior trim closer to the Catalina. The Ventura had Star Chief-grade door panels though, and Catalina exterior trim. Mix and match! I believe the cutouts in the rear package shelf are for a rear window defogger. It was just a fan that blew air up from the trunk. Growing up, we had a ’68 Buick and it had one of these. Us kids in the back seat hated it, it was loud and just blew cold air around. My dad’s ’60 LeSabre has a similarly-shaped cutout. It has neither a speaker nor a fan, so that must have been even on the Buicks. 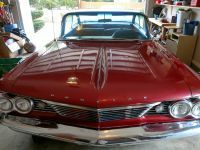 My ’60 Pontiac memory was a school friend’s parents trading in their ’60 Strato Chief (A/T 261 cu in inline six) on a new ’68 Bel Air. 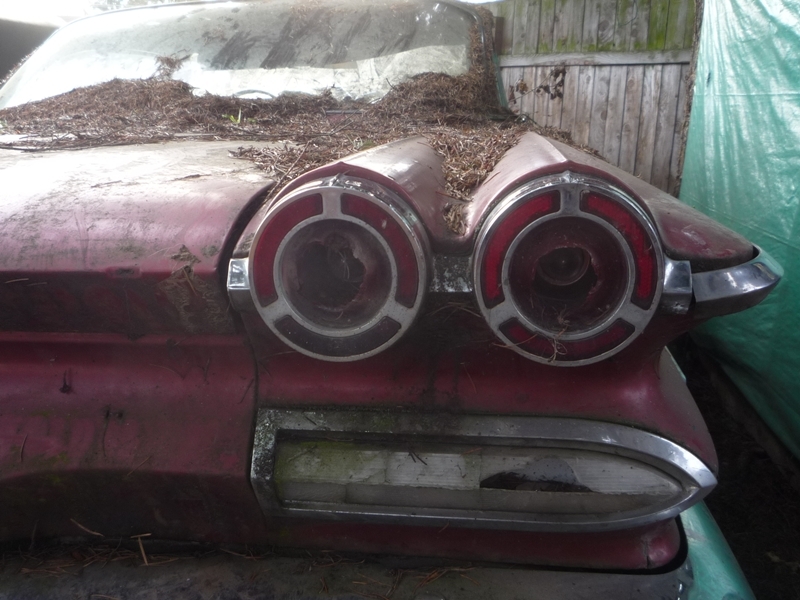 Poor old dear refused to start when the dealer drove round with the new Bel Air. The 60 still looked good, but probably worth less than $500 in a market where an eight year old car was almost in the scrap yard. This reminds me of one of my favorite Matchbox cars from the era… a 60 Convertible in silver beige. Or was it light yellow. Cant remember if it was a Bonneville or Catalina either. I agree it was much more contemporary in style five years on than other 1960 models. It was light yellow. I had one too! If i could find one in an antique toy store, I’d snap it up. Already have the ’64 GP Matchbox. In 2018, I’m working to restore this wonderful ride. My dad bought this car brand new in 1960. He left it to me for enjoyment. I buffed the car this past weekend in preparation for an upcoming car show. Turned out well for 58 year old paint. Very nice! Great colour too.